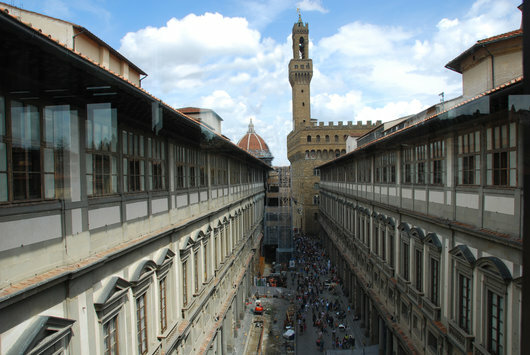 The Uffizi Gallery was first opened as a museum in 1769 by Peter Leopold of the Austrian house of Lorraine. One of the oldest and best known art museums in the world, Galleria degli Uffizi (Uffizi Gallery) was created in 1581 in Florence. As Florence is considered the birthplace of the Renaissance, it only seems fitting that such a prominent museum be located there. Construction began on the museum in 1560 by Giorgio Vasari. It was commissioned by Cosimo I de’ Medici, Grand Duke of Tuscany, of the infamous Medici family, to bring together the various offices he controlled into one place. Even today there are signs of the original intended use of the building. For example, Uffizi means offices in Italian and the rooms were not created to hold the thousands of art lovers that visit each day. The building, which sits on the Arno River, was completed in 1581. The Uffizi Gallery was first opened as a museum in 1769 by Peter Leopold of the Austrian house of Lorraine. The Medici family had always a vast collection of artwork on display, however, it was only enjoyed by those who were invited to into or worked in the building. Pieter wished to share the treasures with the world. I bet he never imagined it would be one of the most popular art museums in the world with entrance lines that can last up to 5 hours. The likes of Botticelli, Raphael, Titan, Michelangelo, and so many more can be found within these historic walls. Even with all these magnificent artists, the heart of the museum is the Tribuna, an octagonal room that was completed by the final architect, Bernardo Buontalenti in 1584. The Tribuna represents the four elements. While there are some pieces of art in this room, the real attraction is the room itself with its intricately designed floor and walls and shell ceiling. With 45 halls dedicated to specific time periods or artists, don’t miss Titan’s Venus of Urbino or Filippo Lippi’s Madonna with Child and two Angels. With all of its rich history or stunning beauty, Florence is a city that should not be missed! For over 38 years, AESU has been the most trusted name in travel. We offer unique, exciting travel programs for college students and young professionals at affordable rates. Each trip is action-packed and informal – designed for people your own age. We are also able to design custom tours just for your group. AESU offers several trips to the Italy, including Euro Focus, Great Escape, Euro Spree, and, of course, Viva Italia. If you have any questions or want help booking your Florentine adventure, please contact AESU by calling 800-638-7640 or fill out the contact form found on our website. This entry was posted on Thursday, August 6th, 2015	at 2:47 pm	. You can follow any responses to this entry through the RSS 2.0	feed. Both comments and pings are currently closed.